ChARM EHR is a cloud-based online, ambulatory Electronic Health Record (EHR), Practice Management and Medical Billing solution for small and medium-sized practices which dramatically improves practice efficiency and quality of care for patients. It allows you to schedule appointments, share pre-appointment questionnaires, record patient visits, maintain comprehensive information about patient’s medical condition, etc. Practices can access patient data, appointment schedules and patient documents anytime, anywhere using a computer or a notebook or an iPad. ChARM EHR is offered as a software as a service (SaaS) that eliminates need to maintain expensive hardware, and you enjoy hassle-free software upgrades without any manual intervention. 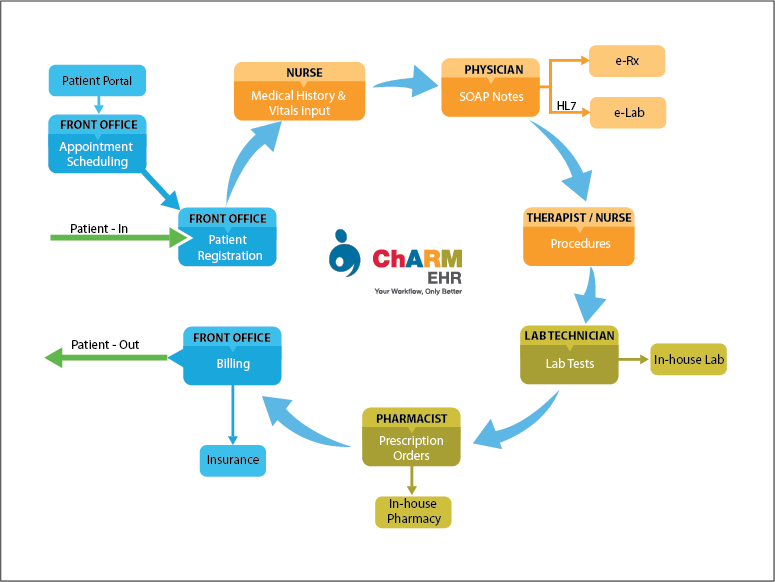 ChARM EHR workflow starts with the patient registration. Front office can register a patient through phone-in or when the patient walks into the clinic. When a patient is registered, patient is also provided a free account in the ChARM Patient portal. All future appointments can be requested through patient portal as well for ease of use. Practice can share Pre-appointment questionnaires to the patient which will show up in the patient portal with a notification to patient in e-mail. Patient can fill-in the questionnaires, share medical history and documents with the practice even before the visit. This greatly reduces the actual patient waiting time at the clinic. ChARM EHR also offers an iPad based Patient Check-in providing patient check-in kiosk application which is useful for walk-in patients to fill-in their details including their medical history, history of present illness, allergies, treatment taken, etc. This information can be instantly accessed by the physician in the patient chart during consultation, so that they can take informed clinical decisions for better healthcare. ChARM EHR supports template creation for commonly used prescriptions, supplements, lab work and diagnosis, allowing rapid data entry into Encounter Charts. Built in customizable templates help you enter data using mostly selection of check-boxes, dramatically reducing the time for text entry. In addition, ChARM also facilitates easy and quick charting through support of various types of encounter such as Quick, Brief and Comprehensive. ChARM integrates with major labs using standard HL7 interface. Lab requests are routed to labs directly and results are pushed back into the EHR for review by physicians. ChARM supports e-prescribing and patient can pick them up at the pharmacy directly reducing the patient wait time. Post encounter, nurse or therapist can look up the chart note and carry out the procedures including injections etc. Front office or Biller can generate the bill and invoice the patient. Biller can track the pending invoices, claims and receivables. ChARM also supports in-house pharmacy module where by the clinics can manage their inventory of medications, supplements etc. and dispense them. Pharmacist can track the stock levels, configure reorder thresholds and also view reports on current inventory, drug expiry and reorder levels.